If it's good enough for James Bond then it's surely good enough for representatives of the world's press. William Boyd's "Solo" opens with James Bond enjoying breakfast on his 45th birthday at The Dorchester, and so it was that journalists and photographers crammed at 9am yesterday into the exclusive Park Lane hotel's The Grill room to listen to what the latest 007 continuation author had to say at the launch of his bringing back Ian Fleming's literary hero. Above: William Boyd poses with one of the copies of "Solo" bound for an international locale. As revealed in "From Russia with Love", breakfast is Bond's favourite meal of the day, Lucy Fleming (his creator's niece and board member of Ian Fleming Publications) reminded the gathered throng in introducing Boyd - and they were to enjoy a hearty morning with the author as he explained his love for the character and his approach to writing "Solo" before posing for the obligatory photographs. His first encounter with Bond - as with so many 007 fans, no doubt - dates back to school, in his case Scotland's Gordonstoun, where after lights-out he and his friends would read to each other (again) "From Russia with Love" as a "a kind of illicit thrill". He was eager to stress he's enjoyed several brushes with 'Bondiana' prior to this, having written films starring Sean Connery and Pierce Brosnan, directing Daniel Craig on-screen himself and even making Ian Fleming a character in his acclaimed novel "Any Human Heart" (2002). Although he's always felt Daniel Day-Lewis would probably play a Fleming-faithful version of 007 best. "It was a great experience and tremendous fun", he said of this project. "I've always been extremely interested in Ian Fleming himself, the man. I re-read all the Fleming novels in chronological order, pen in hand, taking notes and learnt an enormous amount about Fleming's achievement". "Solo", he attested, will certainly adhere to the literary series' tried and tested aspects. M, Felix Leiter and Moneypenny will all be present and correct, while there'll be "a lot of eating and drinking, a lot of interest in clothes - Bond's a sensualist - a certain amount of weaponry, automobiles and of course two beautiful women". When questioned on the old-fashioned attitudes of Fleming's hero, though, he teased his 007 may have moved with the times a little - the book is set at the height of the Vietnam War and protest movement in 1969 - and preferred to suggest that Bond enjoys "relationships with women" rather than the novels featuring "Bond Girls". Yet, the hero will still drink and smoke and do "everything you would expect of the classic Bond". The year of the book's setting also informed Boyd's choice of locations. Having grown up in Africa himself, he was eager to send 007 to the continent (something Fleming only did once and briefly in "Diamonds are Forever") and the civil war into which Bond's thrown in the fictitious African nation deliberately echoes Nigeria's which was raging in 1969. The author also felt the fact he's written two espionage novels was good preparation: "I certainly tackled this with confidence, in that I know how to construct a highly complex plot - I knew how to put the rhythms of suspense and complexity into the novel". 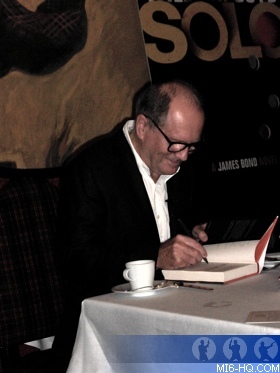 Above: William Boyd signs a copy of "Solo" over breafast at the Dorchester's Grill. And with that William Boyd was gone, off to cruise London on a publicity blitz in the model of Jensen car (an FF Mark I) that Bond drives in his novel. But not before he'd signed seven copies of "Solo" in front of the cameras, each of which was then sealed in a white Perspex box and handed over to a British Airways flight attendant ('another great British brand') whom would be whizzed away with it in one of seven handy Jensens parked outside The Dorchester to Heathrow's Terminal 5 and on to flights bound for the Fleming and/ or Boyd-related international cities Amsterdam, Cape Town, Delhi, Edinburgh, Los Angeles, Sydney and Zurich. Sixty years after his first novel "Casino Royale" was published by Jonathan Cape, Fleming himself would surely have approved and maybe been amused by all the glamour, pomp and circumstance. 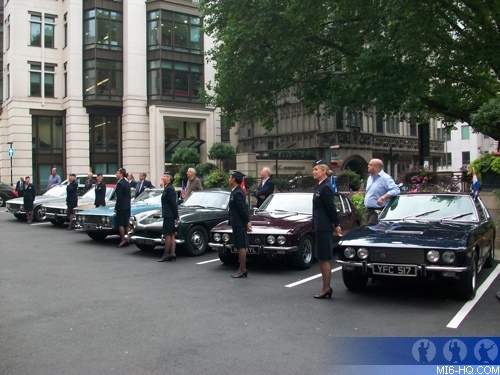 Above: Seven classic cars wait to transport 007 copies of "Solo" to seven different global locations. Indeed, Lucy Fleming commented on the symmetry of "Solo" being published by Jonathan Cape, for this was "the [publishing] house that produced those soft-paged, ink-smelling editions with the Richard Chopping covers that for so many people were their first introduction to James Bond". She added that Ian Fleming Publications were "flattered that not only an author as fine as Will should take up the baton of Bond, but that he should have done so with such panache. "Solo" is an excellent novel and one of which Ian would have approved heartily". All photographs © Adam Bollard. All Rights Reserved. Used With Permission.